I thought one of these days it would be nice to be married. Then I saw this movie. 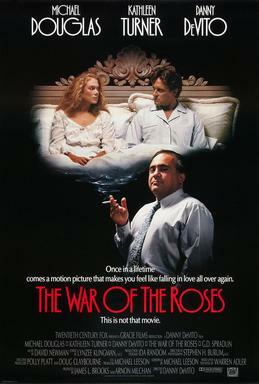 The War of the Roses is a Black Comedy about a wealthy couple with a seemingly perfect marriage. He is a successful lawyer and his wife is building her own catering business. When their marriage begins to fall apart, material possessions become the center of an outrageous and bitter divorce battle. The movie gets most of its laughs from the progress of this couple to the point of no return. They are both two stubborn people and neither one will back down from each others fight. And when they really want to hurt one another they know exactly what buttons to push. The credit has to go to DeVito ,who is director and an actor in this, this film does not take any prisoners for what is over the top. The big thing about this film is that its not light one bit , it keeps getting darker and darker and darker to the point where its just pitch black comedy. This film holds some type of message about married couples that feature two people that think that they are better than one another. The real great thing about the film is that its not all-in-all a comedy it does hold some truth. The truth is that you can start hating somebody if you know everything about that person and if you’ve lived under the same roof with them for so long, as in this case 17 years. Douglas and Turner have great chemistry as a couple who falls deeply mad in love with oneanother then turning into deep and passionate hate for each other. Both of their facial expressions just show how they feel at that exact moment and you know when they are angry. The only problem I had with this film was that at times I felt it was over done too much with the rampage. When I thought they couldn’t go over the bridge enough they went right over and I thought it couldn’t get any worse. Lastly, we never really see why Turner’s character starts hating Douglas’ so much and it kind of left me off at being really confused since I didn’t know what the reason was for so much hate. The film is great at showing a portrait of how you can be so happy as a couple and that can all just change and become ugly. Not many comedies can get as dark as this and DeVito surely shows his directing skills. Love this film – it’s so unapologetically dark. It’s a movie I not only enjoy more with each viewing appreciate more the hard-nosed stand that DeVito and co. take with these characters. I wish DeVito would release his directors cut of the deleted scenes included on the DVD/Blu-Ray.